An expert analyses the factors behind India set to overtake China as the biggest source of oil demand growth from the mid-2020s. One of the biggest stories to impact oil markets over the medium-term (i.e. the next five years) will be India supplanting China as the biggest source of demand growth from the mid-2020s. Modelling each sector of their respective economies, in our recently published ‘Long-term Energy Market Outlook, November 2018’, Energy Aspects projects that total Indian oil demand growth will consistently exceed China’s from 2024. Underpinning this switch will be a combination of more supportive demographics, stronger economic growth, less-developed charging infrastructure for alternative-fuel vehicles (compared to China), an explicit desire to raise the (more energy-intensive) manufacturing share of the economy and a lower base of per capita oil consumption in India than China. All else being held equal, stronger economic momentum tends to support additional oil demand growth. The consensus view is that India’s economy will outpace China’s over the medium-to-long-term. The International Monetary Fund recently updated its World Economic Outlook, citing that it expects the Indian economy to expand in the high 7 per cent per annum ballpark over the next couple of years (7.5 per cent in 2019 and 7.7 per cent in 2020), roughly 1.5 percentage points above the predicted pace of the Chinese economic expansion (6.2 per cent per annum Chinese GDP growth forecast in both 2019 and 2020). This underlying difference in growth could be even wider as many wise macroeconomic sages claim that the true pace of the Chinese economic expansion is currently much closer to 5 per cent (possibly sub-5 per cent), whereas the commonly held belief is that the misquotation on India is far lower. With similarly sized income elasticities calculated for both China and India (0.63 between 2002 and 2018), we conclude that the higher underlying macroeconomic outlook for India should certainly prove a decisive primary driver behind the impending switch in the leader of oil demand growth. Not only are the medium-to-long term projections for the pace of the Indian economic expansion much more upbeat than those for China — the annual GDP growth gap in our models widens towards 2 percentage points over our long-term time horizon to 2040 — but the underlying population statistics are also much more supportive of stronger Indian oil demand growth. The United Nation’s 2017 edition of its ‘World Population Prospects’, for example, suggests (in its central ‘medium variant’ scenario) a little changed Chinese population between 2018 and 2040 (+2.4 million), whereas 251 million more people are envisaged in India. Over this period, the average per annum increase in their respective populations is 0.01 per cent for China and 0.78 per cent for India — small but significant differences. On a related front, the UN’s base-case ‘medium variant’ forecast also foresees the Indian population exceeding that of China’s in 2024. The simple addition of more people is not a certain determinant of higher oil demand alone, although it plays a very important role. However, the strength of the argument for higher oil demand growth improves when a country already features lower per capita consumption. Per capita oil demand in India stood at just 0.004 b/d in 2018, less than half of China’s corresponding metric (0.009 b/d) and seventeen times lower than the US’s (0.062 b/d). The potential upside in Indian demand growth (compared to China) is, hence, enhanced by the lower pre-existing demand in India. One of the best examples of where this potentially pent up demand resides is the road transportation sector, as the level of vehicle ownership in India is much lower than that for China. Figures for 2015 (the latest comprehensive data series available) from the International Organization of Motor Vehicle Manufacturers showed vehicle ownership at 22 vehicles per thousand in India vs 118 per thousand in China. As India is forecast to experience faster wealth growth, relative to China, through our long-term time forecasting time-horizon—a consequence of the more rapid economic uptick—more vehicles will be purchased. These vehicles will often be two-wheelers at first, particularly benefiting Indian gasoline demand growth. Gradually narrowing gaps, in both the levels of vehicle ownership and per capita oil demand, fundamentally underpin the projected handover in 2024 from China to India of the title of biggest contributor to oil demand growth. Whereas a significant uptick in Indian gasoline growth is forecast over the next five years —supported by a large expansion in the Indian vehicle fleet, particularly two-wheelers—the Chinese vehicle fleet is already migrating rapidly towards electric vehicles (EVs), driven by rigorously enforced government policies, with the Chinese uptake of electric two-wheelers already very high and far ahead of that in India. P&S Intelligence, in two separate papers, estimated that the electric scooter and motorcycle market in China already stood at $7.7 billion in 2017, whereas the corresponding metric for India would only reach $0.6 billion by 2025. Only in December 2018 did the Indian Ministry of Power publish detailed plans for public EV charging stations. Under these plans, cities with a population of 4 million or above will eventually be required to have at least one EV charging station in a grid of 3 km, while an EV charging station will be required every 25 km on Indian highways. Impressive as these plans are, they remain to be built, whereas China already had 0.2 million public charging points as of 2017 (energy conglomerate NTPC put the Indian estimate at 222). Although the Indian government is similarly keen to support a rapid migration towards EVs, without comparable levels of infrastructure spend the next five years will predominantly see oil as the main beneficiary from the booming Indian road transport sector. The surging Indian oil demand story is not just a pure road transportation story either. We also forecast strong gains in oil demand in the industrial, aviation, building and shipping sectors. Of the rough 1.6 mb/d that we project (Long-term Energy Market Outlook, November 2018) being added to Indian oil demand by 2024—raising Indian demand by a third vs 2018 (double the percentage point gain from China)—roughly 31 per cent of this growth will come from gasoline (the road transport story), with a similar-sized gain projected for diesel (benefiting from strong gains in industry and shipping demand, as impending shipping legislation will see bunker fuel increasingly switch to marine diesel from 2020). We also forecast sizeable additions for LPG—as residential buildings continue to switch over to LPG for cooking—and jet/kerosene, respectively adding 0.2 mb/d and 0.1 mb/d between 2018 and 2024. Further supporting more robust Indian demand growth vis-à-vis China—particularly for diesel, LPG and bitumen—will be India’s increased focus on more energy-intensive manufacturing, with an explicit government target to raise the manufacturing share of the economy to 25 per cent by 2025, from 15 per cent in 2017. The significance of the projected change in the leading contributor to oil demand growth is magnified as total Indian oil demand starts from a much lower base compared to Chinese oil demand. Oil demand in 2018 averaged 4.8 mb/d in India and 12.6 mb/d in China. For Indian oil demand growth, in b/d, to first exceed the corresponding Chinese metric (by 2024), the percentage-point growth from India in our models needs to be more than double the percentage point expansion for China. A final important caveat, however, is that even with consistently much stronger Indian demand growth foreseen throughout our long-term models, total Chinese oil demand continues to exceed India’s out to 2040. 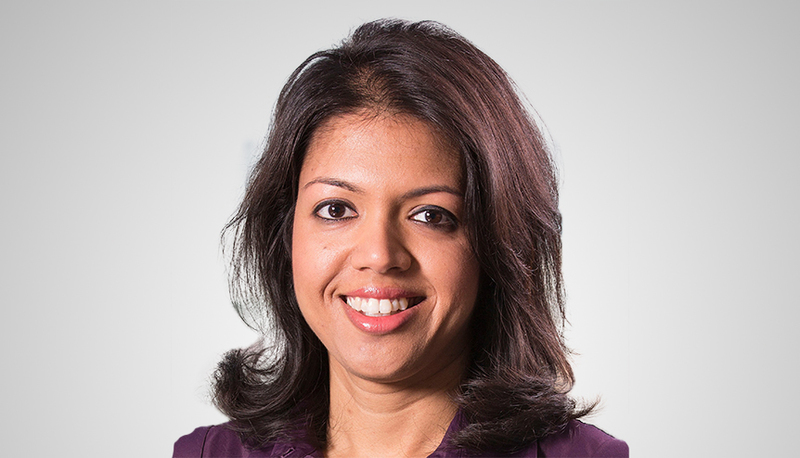 Amrita Sen is the Co-Founder, Head of Research and Chief Oil Analyst at Energy Aspects, an independent research consultancy providing analysis of energy markets.